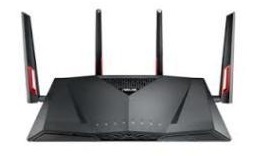 The main functions which makes it as a perfect is its Ultra-fast 802.11ac dual-band Wi-Fi routing capabilities that boosts speeds up to 2167 Mbps for online gaming with smooth 4K UHD video playback and fast file-sharing . Designed to work with MU-MIMO beamformig technology , it has 4×4 antenna that can connect multiple MU-MIMO-compatible clients with maximum speed and security upto 5GHz all together. As we know that AiProtection provides commercial-Grade Security for our home network . it is a The smart and effective way to block intruders and ‘man in the middle. There is always someone ready to spoil your effective Internet of Things devices and there is hackers present always who wants to steal your personal information .We must be very keen while transferring Internet traffic through Wi-Fi routers,the security of data that goes out of the devices on our network, AiProtection is the technique that can monitor and inspect the traffic , it also checks loophole from where any attacker can take advantage of it. AiProtection make it sure for the secure logins and open ports . ASUS equipped with it that provides best network security with privacy protection and parental controls alongwith Internet of Things security .